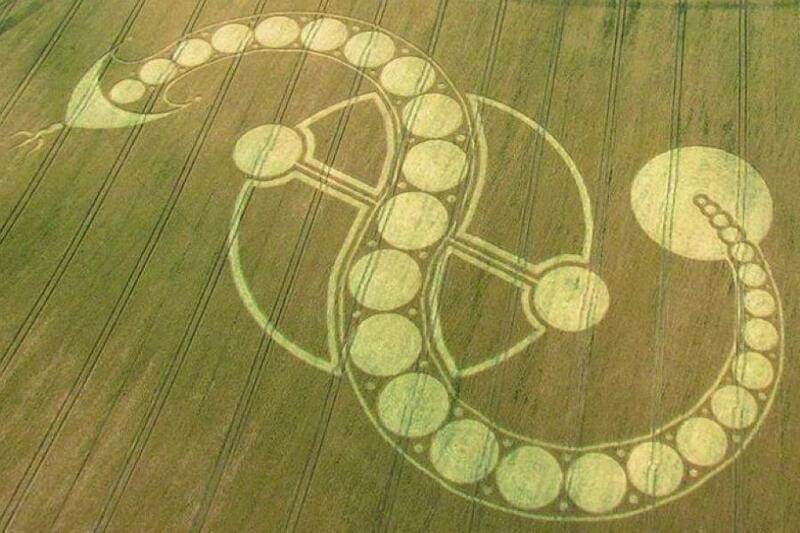 What Are Crop Circles And Why Are People Obsessed With Them? 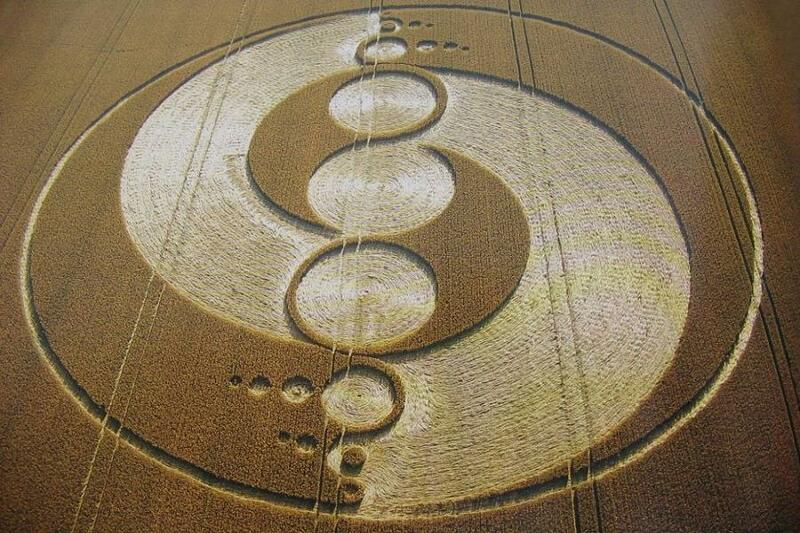 Mysterious circles have "appeared" on farms since the mid-1970s. 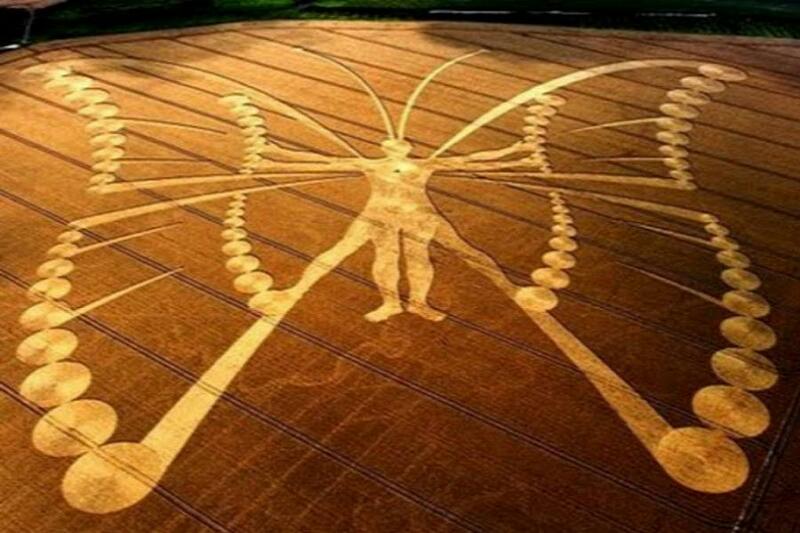 But the most interesting thing about crop circles is our reaction to them. The farmer’s crops had been flattened in a spiraling circular pattern overnight, with the stalks somewhat mounded toward the center and the surrounding vegetation seemingly undisturbed. 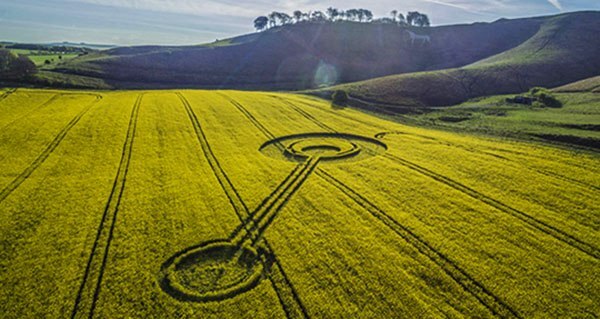 This was the first recorded crop circle, and it left the people of 17th-century Hartfordshire as baffled then as they would be 300 years later, when it happened again. In the summer of 1978, a Hampshire farmhand named Ian Stevens arrived to work in a field owned by his employer, Tim Brown. When he got there, he found that the field had been marked with five large circles, each 60 feet across. The circles were arrayed in a pattern with a single circle in the middle and the other four ringed around it. The crops inside were apparently undamaged, with only the occasional broken stalk, but they had all been flattened in a clockwise direction as if pressed from above. No witnesses could be found who had seen anything unusual, and even a careful inspection of the surrounding area failed to turn up any footprints or other obviously human artifacts. Technically, this was evidence of a crime – trespassing and destruction of property – but local police could hardly start an investigation of such an odd offense without leads, and the site offered nothing substantial. It was as if the circles had just spontaneously appeared. Humans being what they are, the mysterious nature of all this led some to immediately reach for the most farfetched explanations imaginable. While some fantasists took the relatively sober line that these circles may have been caused by sudden, highly localized weather events (small tornadoes, which inexplicably touched down in five places to make a geometric pattern and which happened to spin the wrong way for the Northern Hemisphere), others felt themselves under no obligation to reality and spun fantastic tales of faeries, angels, UFOs, magnetic vortices that for some reason only affected wheat, and suchlike. Arabia WeatherThe Middle East is notoriously short on lush fields of grain. 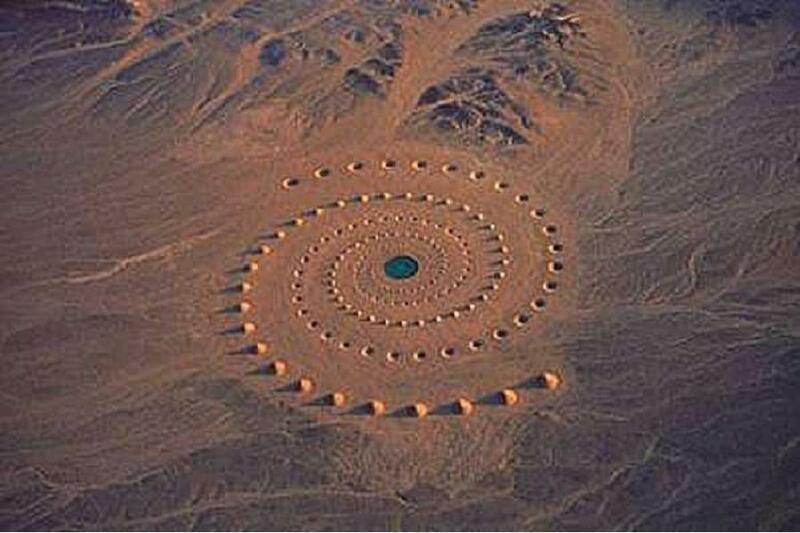 This circle appeared in Egypt and is made by scooping sand out of progressively larger holes in one spiral and piling it back up to make the mounds of the other. Soon, more circles appeared in southern England, mostly in and around Hampshire and Wiltshire, and almost always in fields close to access roads that had no barrier fences. By the late 1980s, the phenomenon had gotten significant press notice in the English-speaking world. Coincidentally, this was also the time when crop circles started mysteriously appearing in almost every English-speaking country; again, almost always in fields near convenient roads and almost never in fenced-off areas. As media reports spread into French and German media outlets, nearly identical circles started appearing in France and Germany, followed by a spate of Eastern European circles after Soviet-Bloc news outlets translated the stories into Hungarian, Czech, Russian, and Polish. Again, theorists all over the Western world spun hypotheses about UFOs, alien contact, and secret government conspiracies to hide the truth. A brief flurry of alarm was generated when one cereologist – which is what crop circle experts insist on being called – took a Geiger counter into one field and reported that he detected low levels of radiation coming from the flattened crops. Tabloid media took this as proof-positive that UFOs have some kind of advanced atom-splitting technology that lets them hover over fields at night and make the circles, albeit while shedding trace amounts of radioactive elements, many of which are naturally present in the soil and groundwater – a fact left out of the most breathless reporting. WordPressThis image, which appears to be of a large serpent, appeared in southern England, not far from Stonehenge. In 1991, two English gentlemen, Doug Bower and Dave Chorley, started telling the world’s media a remarkable tale. The two men, who were 67 and 62 years old, respectively, claimed to have been sneaking out at night to make what they called “corn circles” since 1976. According to them, the whole idea started over a pint of beer in their local pub, where they decided it would be a bit of a laugh to put some mysterious circles in nearby fields and see what the self-appointed “experts” came up with to explain the phenomenon. For the first two years, they claimed, nobody had paid any attention to their hijinks, and that they were on the point of giving up for lack of interest, but that after the 1978 flurry of attention in the press, they rededicated themselves to their nighttime antics. The pair had never been discovered in the act. In fact, their only close call so far had come in 1985, when Bower’s wife noticed that their car’s odometer had an awful lot more miles on it than a daily trip to the pub with Chorley would justify. To allay his wife’s suspicion, Bower showed her his sketches of the dozens of circles he’d made up to that point and asked her to design one of her own, which dutifully appeared the next day in a nearby field. After that, the pair had merrily continued sneaking into open fields at night and scanning the news the next day for mentions of the “superior intelligence” that had to be at work in the farm country. The two even made the acquaintance of local UFOlogists and volunteered to help them find circles in the area, which naturally ensured that every circle got the attention it deserved.